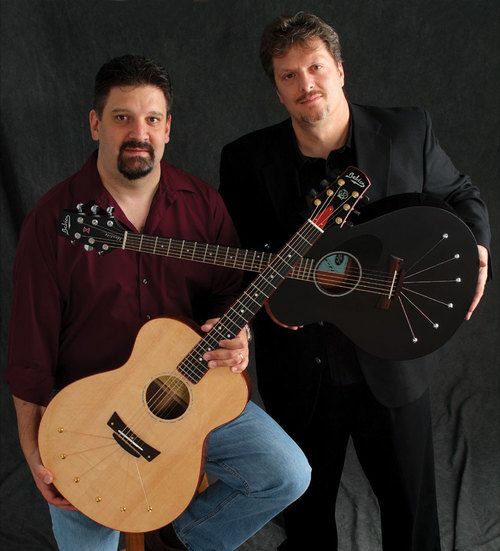 Babicz Guitars was established in late 2003 by Jeff Carano and Jeff Babicz, veterans of the guitar industry, and both players themselves. As the executive management team for the headless Steinberger Guitar company in the 1980's and early '90's, Carano and Babicz experienced success in selling products throughout the world due to their unique relationship with domestic and international distributors, as well as a cohesive artist relations program. Their experience has demonstrated the value of a strong marketing program in combination with proven business practices. Over the years Babicz Guitars has made a considerable impact in the highly competitive guitar industry. This has been accomplished through the development of innovative and revolutionary patented guitar designs of Jeff Babicz, and through its enthusiastic acceptance by the international artist community, corralled by Jeff Carano. The Babicz guitar is unique in that it's designed by a musician for a musician. When Jeff Babicz set out to "re-design" the acoustic guitar, his three main objective were improvements in string action height, sonic qualities, and intonation. What Jeff developed was an award winning guitar which feature the following technology. The proprietary Continually Adjustable Neck is an innovative approach to adjusting the string height ("action") of a guitar in a fast and seamless motion. This is achieved by allowing the neck to slide up or down, with the turn of an ordinary Allen key, on command, by the musician. This adjustment has little or no effect on the intonation of the guitar. When the strings are removed from the bridge and anchored to the top of the guitar, a lateral compression force is created (compression of wood within the soundboard, not compression of tone or frequency). The Babicz Torque Reducing Split Bridge is not glued to the soundboard, but secured via special fasteners. For optimum performance, these fasteners can be released, and the entire bridge can be repositioned to achieve proper intonation throughout the entire life of the guitar. This is possible due to the absence of bridge pins (and glue), as well as the incorporation of proprietary fastener slots provided in the soundboard. Everyone from legends like Todd Rundgren and Earl Slick, to Heavy Metal icons Judas Priest and Queensryche, or Southern Rockers like Lynyrd Skynyrd, The Outlaws and Molly Hatchet, Nashville session players like Fred Newell and Doc Wooten, Classic Rock 'n Rollers like Joe Lynn Turner, Foreigner, Howard Leese and The Pretenders, Pop Super Stars The Black Eyed Peas, even acclaimed virtuoso Adrian Belew, have made Babicz their guitar of choice. “While Babicz’ innovations are impressive, the best part is that the guitar is a lot of fun to play. Because I was able to set it up to play much easier than any of my own guitars, I particularly enjoyed playing difficult chord-melody material, and I found that the guitar responded well to a light right-hand touch. Adjusted with higher action, the Babicz also took well to more aggressive strumming, making its included Allen wrench a magic wand of flexibility”. “In a matter of seconds I took the Jumbo Cutaway from a robust strummer to a low-action flat-picking shred machine. It’s really amazing…Certain passages have a clarity on this guitar that I had a hard time matching on other acoustics—almost like a 6-string high-definition TV”. …the versatility, durability and sound are mind boggling, especially for a guitar in this price range. Babicz offers numerous different models, some perhaps more conventional looking, but the darkly dashing black Spider is a standout guitar in every respect…extremely balanced tone, fuller sound, fast and advanced neck-adjustment system, great value for price”. Interested in purchasing a Babicz guitar and have a question?